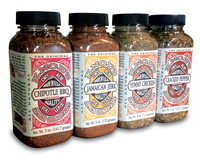 hands-down, is Knox's Spice Company Chipotle B-B-Q Dry Rub"
The articles below are provided by Knox's Spice Company. Since we have the opportunity to play with BBQ rubs more often than most people, we will attempt to post articles of our ventures. Please feel free to browse what we have so far. Hopefully we can help you, help yourself. Article: Goat, the other red meat. Recipe: Cracked Pepper Bacon for B.L.T's, yuummmy! Recipe: Chipotle BBQ hamburgers, the spice of life.